Earlier this year, it was reported that Chinese automaker Beijing Auto International Corporation (BAIC) was set to make Malaysia as its electric vehicle manufacturing hub for the region, and that its new plant Gurun, Kedah, was expected to be operational in July 2016. Now, more progress has been reported – the automaker and its local JV partner Amber Dual have completed prototyping of its planned EV, and production is expected to begin by September or October next year, according to Malaysia Automotive Institute (MAI) CEO Madani Sahari. The car will not just be produced for local consumption, but for ASEAN markets as well. 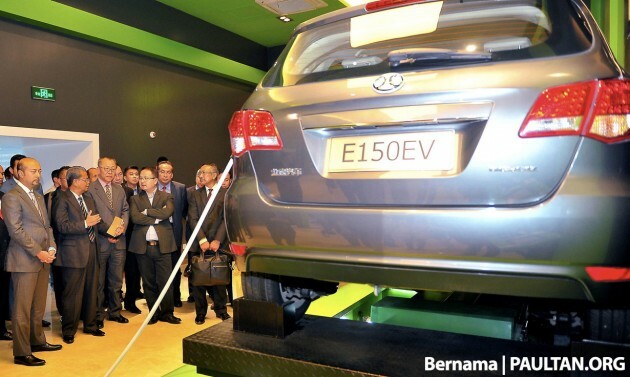 In May, Amber Dual’s managing director Shabudin Md Saman said the project had kicked off in Gurun, with the bulk of R&D work set to centre around the conversion of the vehicle’s original left-hand drive system to right-hand drive, at the cost of about RM50 million. The Chinese automaker is aiming to produce between 2,000 and 3,000 EVs next year, with a gradual yearly increase. The report had indicated that prototypes were expected to be ready in December, and so the latest news has the project on track as anticipated. The model on display then was an E150 EV – specs for the Chinese version include a motor putting out 61 hp and 144 Nm, with a 25.6 kWh lithium-ion battery offering the car an operating range of 150 km. BAIC’s Gurun plant, which will cost between RM200 million and RM300 million to build, won’t just be an assembly plant – the facility will also serve as a marketing centre for BAIC vehicles for the entire ASEAN region. Currently, Amber Dual’s website lists two other, more conventional offerings – a BAIC A113/A115 hatch and a van called the MB55. Interestingly, photos on the company’s website hints that Go Automobile Manufacturing (GoAuto), the folk behind the Great Wall M4, looks to be involved in the production of the MB55, or at least its production line is. There are so many electric taxis on the streets of China. We can learn from them. 61hp only? Must be rolling along at 80kmh max speed. EV got 100% torque in all RPM range. If EV mated with CVT, it could up to 140-150 range. Town driving taxi, does not require high speed rite? This one only has 150 km range. But P1 is so slow! Its not slow my friend. We have lack of gov support. The car is ready at no time. Good news. More employment opportunities and exports for our auto industry. Amber Dual and BAIC should keep in mind Chery Alado’s and GoAuto Great Wall’s mistakes; that is, they should not skimp on quality and aftersales. They need to work with good vendors and build up their aftersales quickly. Since it’s an EV, that narrows down their market to just the Klang Valley and maybe Penang. The other regions can wait. Don’t try to take on the whole Malaysia at once, start city by city. And value your first customers, don’t treat them like fools. Most of all, don’t give up when your sales start slowing 1 or 2 years down the line, it will take time to raise awareness on an unknown company. Personally, I don’t see many Malaysians buying this BAIC EV for many reasons, but I do believe it will have some success as company cars and whatnot… as a ‘green car’. The success of the new BAIC will depend on how well it can convince companies like COMOS to partner up with them. If the government can offer a rebate for electric passenger cars, then it will be cheaper and more competitive too. Kpd Cina Malaysia: Bila balik Tongshan?